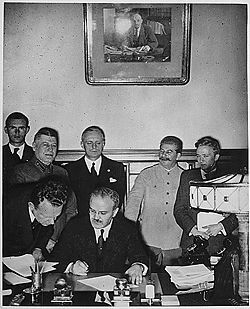 The Molotov-Ribbentrop Pact, named after Soviet foreign minister Vyacheslav Molotov and German foreign minister Joachim von Ribbentrop, was an agreement officially entitled the Treaty of Non-aggression between Germany and the Union of Soviet Socialist Republics, signed in Moscow in the early hours of August 24, 1939, dated August 25, that renounced warfare between the two countries and pledged neutrality by either party if the other were attacked by a third party. Each signatory promised not to join any grouping of powers that was “directly or indirectly aimed at the other party.” The Pact is known by a number of different titles. These include the Nazi-Soviet Pact; Hitler-Stalin Pact; German-Soviet Non-aggression Pact and sometimes as the Nazi-Soviet Alliance. It remained in effect until Nazi Germany invaded the Soviet Union on June 22, 1941 in Operation Barbarossa. In addition to stipulations of non-aggression, the treaty included a secret protocol dividing the independent countries of Finland, Estonia, Latvia, Lithuania, Poland, and Romania into Nazi and Soviet spheres of influence, anticipating "territorial and political rearrangements" of these countries' territories. All were subsequently invaded, occupied, or forced to cede territory by Nazi Germany, the Soviet Union, or both. Only Finland was able defend herself against the (Soviet) invasion and remained a quasi-independent Western democracy. Many on the political left were outraged that the Soviet Union would make such a treaty with Nazi Germany, the revolutionary system which most threatened communism. Many communists in Western parties repudiated this action and resigned their party membership in protest. Likewise, a number of Nazis were outraged by this treaty, and some party members went so far as to throw their party badges into the courtyard of the Brown House. Although the Molotov-Ribbentrop Pact briefly united Hitler's Germany and Stalin's Russia, the Nazi invasion of Russia ended the Pact and shifted the Soviet Union from the Axis Powers to the Allied Powers. Alliances of aggressor nations tend to be short-lived as neither is capable of accommodating the interests of the other for long, except for a brief period of expediency. In 1918, by the Treaty of Brest-Litovsk, Bolshevik Russia accepted the loss of sovereignty and influence over Finland, Estonia, Latvia, Lithuania, Poland, Belarus, Ukraine, and parts of Armenia and Georgia as a concession to the Central Powers. In accordance with the Mitteleuropa-policy, they were designated to become satellite states to, or parts of, the German Empire, ruled by dukes and kings related to the German emperor. As a consequence of Germany's defeat in the autumn of 1918, and not without active support from the allied victors of the World War, most of them became ostensible democratic republics. With the exception of Belarus and Ukraine, all of these countries also became independent and fully sovereign — however, in many cases, independence was followed by civil wars related to the Russian Revolution of 1917. Poland, whose statehood had just been re-established by the Treaty of Versailles, sought to take control of Ukrainian and Belorussian territory which it had ceded at the time of various partitions. Poland invaded Soviet Ukraine in April 1920, leading to the Russo-Polish War, which ended with the Peace of Riga in 1921. In the 1920s, fear of the Soviet Union and of Communism motivated attempts to foster political cooperation and defense treaties between these so-called buffer states. The European balance of power established at the end of World War I was eroded step by step, from the Abyssinian crisis (1935) to the Munich Agreement (1938). The dissolution of Czechoslovakia signaled increasing instability, as Nazi Germany, the Soviet Union and other countries, such as Hungary and Bulgaria, aspired to regain territories lost in the aftermath of World War I. In 1938, the Soviet Union blockaded the free navigation of ships from the Baltic Sea to Finnish ports on Lake Ladoga via the Neva River. The Western states, United Kingdom and France, guarantors of the territorial status quo, stood by until the March 1939 destruction of Czechoslovakia, maintaining a policy of "non-intervention" while the Fascist governments of Germany and Italy supported the victorious right-wing rebels in their destruction of the Soviet-supported Spanish Republic in the Spanish Civil War of 1936-1939. For the Soviet Union, the Molotov-Ribbentrop Pact represented a response to the deterioration of the European security situation in the latter half of the 1930s, as Nazi Germany, aligned with Fascist Italy in the Axis Powers, aimed to reverse the disadvantageous Treaty of Versailles after World War I. In addition, border incidents with Japan, culminating in the Battle of Khalkhin Gol, may have been a significant consideration for the Soviets, for whom a two-front war was an anathema. The Pact may, in fact, have influenced the Japanese to seek a cease-fire three weeks after its announcement. For its part, the Soviet Union was not interested in maintaining a status quo, which it saw as disadvantageous to its interests, deriving as it did from the period of Soviet weakness immediately following the 1917 October Revolution and Russian Civil War. Helping Germany grow strong as a counterbalance against Western powers had accordingly been Soviet policy from 1920 to 1933. A fourth partition of Poland was suggested at regular intervals, satisfying Lenin's imperative that the Versailles Treaty be undermined by destroying Poland. Once Hitler renounced the military cooperation between Nazi Germany and Soviet Russia that Hans von Seeckt had arranged, Stalin adopted the Popular Front policy, trying to draw the Western powers into war with Germany. Soviet leaders adopted the position that war between what they characterized as rival imperialist countries was not only an inevitable consequence of capitalism, but by weakening the participants, such a war would also enhance conditions for the spread of Communism. During 1938, the Soviet Union (as well as France) offered to abide by their defensive military alliance with Czechoslovakia in the event of German invasion, but the Czechoslovakian Agrarian Party was so strongly opposed to Soviet troops entering the country that they threatened a civil war might result if they did. The 1935 agreement between the Soviet Union, Czechoslovakia, and France stipulated that Soviet aid was conditional and would only come to Czechoslovakia if France came to their aid as well. In 1936, troubled by the failing five year (economic) plan, the Soviet Union started tacking closer to Germany again, returning to economic cooperation. The Moscow Trials seriously undermined Soviet prestige in the West, signifying that either (if the accused were guilty) the Soviet government was hopelessly infiltrated by fascist powers or (if the accused were innocent) that Stalin was mercilessly killing his opponents and subordinates. Either way, the Soviets were deemed to be worthless allies. George Kennan stated that the "purges made some sense" only in the context of the search for an accommodation with the Third Reich. Soviet intervention in the Spanish Civil War, as well as the blatant attempts to undermine the governments of foreign countries, were also viewed with skepticism. Furthermore, the Western countries were still hoping to avoid war by a policy of appeasement. In Moscow, the reluctance of the Western nations to go to war against Germany was seen as indicative of a lack of interest in opposing the growing Fascist movement, already exemplified by the events of the Spanish Civil War. The Soviets were not invited to the Munich Conference of September 1938, when the French and British Prime Ministers, Daladier and Chamberlain, agreed to the dismemberment of Czechoslovakia. As the French had not honored their 1924 treaty with the Czechs, the Soviets suspected that their 1935 alliance pact with France was worthless, and that the West was trying to divert Germany to the East. In March 1939, Hitler's denunciation of the 1934 German-Polish Non-Aggression Pact was taken by the Soviets as a clear signal of Hitler's aggressive intentions. In April, Soviet foreign minister Litvinov outlined a French-British-Soviet alliance, with military commitments against Fascist powers, but Chamberlain's government procrastinated (partly because the Soviets demanded too much – impossible troop commitments, Soviet annexation of the Baltic states, complete reciprocity, and the right to send troops through Poland). Chamberlain, however, had already on March 24, along with France, guaranteed the sovereignty of Poland, and subsequently on April 25 signed a Common Defense Pact with Poland. Consequently, Stalin no longer feared that the West would leave the Soviet Union to fight Hitler alone; indeed, if Germany and the West went to war, as seemed likely, the USSR could afford to remain neutral and wait for them to destroy each other. Negotiations between the Soviet Union, France and the United Kingdom for a military alliance against Germany stalled, mainly due to mutual suspicions. The Soviet Union sought guarantees for support against German aggression and recognition of the right of the Soviet Union to act against "a change of policy favorable to an aggressor" in the countries along the western Soviet border. Although none of the affected countries had formally asked for protection by the Soviet Union, it nevertheless announced "guarantees for the independence of Finland, Estonia, Latvia, Poland, Romania, Turkey, and Greece," the so-called cordon sanitaire erected between Nazi Germany and the Soviet Union. The British and French feared that this would allow Soviet intervention in neighboring countries' internal affairs, even in the absence of an immediate external German threat. However, with the Third Reich now demanding territorial concessions from Poland in the face of Polish opposition, the threat of war was increasing. Although telegrams were exchanged between the Western Powers and the Soviet Union as early as April 1939, the military missions sent by the Western Powers (on a slow transport vessel) did not arrive in Moscow until August 11, and were given no authority to conduct talks resulting in binding agreements or to sign treaties. in case of the involvement of a participant in war due to rendering assistance to a European country which has pled for aid. The military negotiations lasted from August 12 to August 17. On August 14, the question of Poland was raised by Voroshilov for the first time. The Polish government feared that the Soviet government sought to annex disputed territories, the Eastern Borderlands, received by Poland in 1920 after the Treaty of Riga ending the Polish-Soviet war. Therefore, the Polish government refused to allow the Soviet military to enter its territory and establish military bases. Three weeks into August the negotiations ground to a halt, with each side doubting the other's motives. It should also be noted that the Soviets had already had contacts with the Germans throughout the spring of 1939. The Soviet Union pursued secret talks with Nazi Germany, while conducting public ones with United Kingdom and France. From the beginning of the negotiations with France and Britain it was clear that Soviet position required agreeing to their occupation of Latvia, Estonia and Lithuania . Finland was to be included in the Soviet sphere of influence as well. The public nature of talks with France and Britain increased the pressure on Hitler by Stalin to heighten his price in reward for alliance with the Soviets . The Soviet position was that they entered the non-aggression pact after the September 1938 Munich Agreement had made it evident that the Western nations were pursuing a policy of appeasement and were not interested in joining the Soviet Union in an anti-fascist alliance promoted through their Popular Front policy. In addition, there was concern about the possibility that France and the United Kingdom would stay neutral in a war initiated by Germany, hoping that the warring states would wear each other out and put an end to both the Soviet Union and Nazi Germany. Observers of the Soviet Union and biographers of Stalin point out that he believed the British rejected his proposal of an anti-fascist alliance because they were plotting with Nazi Germany against the Soviet Union, that the Western nations were expecting the Third Reich to attack the Soviet Union, and that they were hoping that Nazi Germany would destroy the Soviet Union — or that both countries would fight each other to the point of exhaustion and then collapse. These suspicions were reinforced when Chamberlain and Hitler met for the Munich Agreement. Additionally, Stalin's critics maintain that one reason why the Soviet Union was not in a position to fight a war was Stalin's Great Purge of 1936 to 1938 which, among other things, eliminated much of the military's most experienced leadership. Historians are split over the impact of the Purges. One the one hand, when German forces did attack the Soviet Union on June 22, 1941, the Red Army was completely unprepared for the assault, despite multiple advanced warnings from foreign, as well as Soviet, intelligence. Others question the skill of those who were purged (e.g., Marshal Tukhachevsky) believing that their elimination made possible the emergence of the next generation of Soviet military leaders (e.g., Marshal Zhukov) who eventually played a central role in the subsequent defeat of Germany. Critics counter that most of the succeeding generation was reactionary, dissolving the most modern part of the Red Army, and that one of the critical problems for the Soviets during the war was a shortage of commanders. Stalin retained a number of inept ultraconservative 'old-guard' military leaders such as Budenny, Grigory Kulik, and Voroshilov. Critics of Stalin question his determination to oppose Germany's growing military aggressiveness, as the Soviet Union began commercial and military cooperation with Germany in 1936 and upheld this relationship until the German invasion began. After the British and French declaration of war on Germany, these economic relationships allowed Germany to partially circumvent the Allied naval blockade, allowing it to avoid the disastrous situation it faced in World War I. However, Soviet industry also benefited from cooperation with Germany, so such cooperation itself provides no argumentation for or against Stalin's motives. Some critics, such as Viktor Suvorov, claim that Stalin's primary motive for signing the Soviet-German non-aggression treaty was Stalin's calculation that such a pact could result in a conflict between the capitalist countries of Western Europe. This idea is supported by Albert L. Weeks. It must be noted, however, that other claims by Suvorov (whose real name is Vladimir Rezun, a low-level GRU defector with no background in military history), such as the absurdity of Stalin's planning to invade Germany in 1941, have been thoroughly and completely debunked by reputable military historians. "The Prussian Tribute in Moscow," satirical newspaper Mucha, September 8, 1939, Warsaw. The Soviets, as well as representatives of the Western nations, had contacts with the Germans throughout the spring of 1939. On May 3, 1939, the Soviet Secretary General Joseph Stalin replaced Maxim Litvinov (Jewish by ethnicity) with Molotov as Foreign Minister, thereby opening the possibility for negotiations with Nazi Germany. Litvinov had been associated with the previous policy of creating an anti-fascist coalition, and was considered pro-Western by the standards of the Kremlin. Molotov let it be known that he would welcome a peaceful settlement of issues with Germany. In Jonathan Haslam's view Stalin's adherence to the collective security line was purely conditional. This is completely in line with the politics of the times, given the Western nations' "conditional" adherence to their guarantees to Czechoslovakia. During the last two weeks of August 1939, the Nomonhan Incident reached its peak, involving more than 100,000 men on both sides. After contacting Molotov on August 15, 1939 regarding the possibility of "settling by negotiation all outstanding problems of Soviet-German relations," and stressing the urgency of such negotiations, the German Foreign Minister Ribbentrop visited Moscow on 19 August 1939. A seven-year German-Soviet trade agreement establishing economic ties between the two states was signed for a German credit to the Soviet Union of 200 million marks in exchange for raw materials–gasoline, grain, cotton, phosphates, and timber. Molotov then proposed an additional protocol "covering the points in which the High Contracting Parties are interested in the field of foreign policy." This was thought by some to have been precipitated by the alleged Stalin's speech on August 19, 1939, where he supposedly asserted that a great war between the Western powers was necessary for the spread of World Revolution. On August 22 Moscow revealed that Ribbentrop would be visiting Stalin the next day. This happened while the Soviets were still ostensibly negotiating a military pact with the British and French missions in Moscow. With the Western nations unwilling to accede to Soviet demands, Stalin instead entered a secret Nazi-Soviet alliance: On August 24, a 10-year non-aggression pact was signed with provisions that included: consultation; arbitration if either party disagreed; neutrality if either went to war against a third power; no membership of a group "which is directly or indirectly aimed at the other." Most notably, there was also a secret protocol to the pact, revealed only on Germany's defeat in 1945, according to which Hitler and Stalin divided the states of Northern and Eastern Europe into German and Soviet spheres of influence. In the North, Finland, Estonia and Latvia were apportioned to the Soviet sphere. Poland was to be partitioned in the event of its "political rearrangement"—the areas east of the rivers Narev, Vistula and San going to the Soviet Union while the Germans would occupy the west. Lithuania, adjacent to East-Prussia, would be in the German sphere of influence. According to the secret protocol, Lithuania would receive Vilnius, its current capital, then belonging to Poland (this fact is often omitted by the Lithuanians themselves who therefore benefited from the agreement, at least before Lithuania was incorporated into the USSR). In the South, the Soviet Union's interest and German lack of interest in Bessarabia, a part of Romania, were acknowledged. A German diplomat Hans von Herwarth informed his U.S. colleague Charles Bohlen of the secret protocol on August 24, but the information stopped at the desk of President Franklin Roosevelt. Concerns over the possible existence of a secret protocol were first expressed by the intelligence organizations of the Baltic States scant days after the pact was signed, and speculation grew stronger when Soviet negotiators referred to its content during negotiations for military bases in those countries. The German original was presumably destroyed in the bombing of Germany, but a microfilmed copy was included in the documents archive of the German Foreign Office. Karl von Loesch, a civil servant in Foreign Office, gave this copy to British Lt. Col. R.C. Thomson in May, 1945. The Soviet Union denied the existence of the secret protocols until 1988, when Politburo member Alexander Nikolaevich Yakovlev admitted the existence of the protocols, although the document itself was declassified only after the dissolution of the Soviet Union in 1992. In December 1989, the first democratically elected Congress of Soviets "passed the declaration admitting the existence of the secret protocols, condemning and denouncing them." "Second Ribbentrop-Molotov Pact" of 28 September 1939. Map of Poland signed by Stalin and Ribbentrop adjusting the German-Soviet border in the aftermath of German and Soviet invasion of Poland. Stalin, who had feared that the Western nations were encouraging Hitler to attack the Soviet Union, must have been aware that the secret clause made a European war more likely, because it freed Hitler from the prospect of a war against the USSR while fighting France and the United Kingdom. 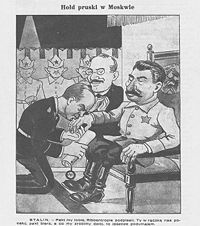 For a long time, the primary motive of Stalin's sudden change of course was assumed to be the fear of German aggressive intentions. The defenders of the Soviet position argued that it was necessary to enter into a non-aggression pact to buy time, since the Soviet Union was not in a position to fight a war in 1939, and needed at least three years to prepare. Edward Hallett Carr claimed: "In return for non-intervention Stalin secured a breathing space of immunity from German attack." According to Carr, the "bastion" created by means of the Pact, "was and could only be, a line of defense against potential German attack." An important advantage (projected by Carr) was that "if Soviet Russia had eventually to fight Hitler, the Western Powers would already be involved." However, during the last decades, this view has been disputed. According to Werner Maser, the claim that "the Soviet Union was at the time threatened by Hitler, as Stalin supposed, …is a legend, to whose creators Stalin himself belonged." In Maser's view the fact that, at the time "neither Germany nor Japan were in a situation [of] invading the USSR even with the least perspective [sic] of success," could not have been unknown for Stalin. Stalin also received espionage reports from Tokyo. Richard Sorge, the now-legendary Soviet spy, reported on crucial German-Japanese negotiations. As a member of the Anti-Comintern Pact directed against the Soviet Union, which Japan signed with Nazi Germany on 25 November 1936, Japan was eager for an offensive against the Soviet Union. Germany's reaction to this was telling: its diplomats tried to persuade Japan to enter into an alliance against the Western nations (France and Britain). Stalin decided that this information, combined with the announcement of Germany's "Pact of Steel" with Italy, indicated that Hitler was more interested in western aggression at the time. The extent to which the Soviet Union's post-Pact territorial acquisitions may have contributed to preventing its fall (and thus a Nazi victory in the war) remains a factor in evaluating the Pact. Soviet sources point out that the German advance eventually stopped just a few kilometers away from Moscow, so the role of the extra territory might have been crucial in such a close call. Others postulate that Poland and the Baltic countries played the important role of buffer states between the Soviet Union and Nazi Germany, and that the Molotov-Ribbentrop Pact was a precondition not only for Germany's invasion of Western Europe, but also for the Third Reich's invasion of the Soviet Union. The military aspect of moving from established fortified positions on the Stalin Line into undefended Polish territory could also be seen as one of the causes of rapid disintegration of Soviet armed forces in the border area during the German 1941 campaign, as the newly constructed Molotov Line was unfinished and unable to provide Soviet troops with the necessary defense capabilities. Soviet propaganda and representatives went to great lengths to minimize the importance of the fact that they had opposed and fought against the Nazis in various ways for a decade prior to signing the Pact. However, the Party line never went as far as to take a pro-German stance; officially, the Molotov-Ribbentrop Pact was worded as a non-aggression treaty, not a pact of alliance. Still, it is said that upon signing the pact, Molotov tried to reassure the Germans of his good intentions by commenting to journalists that "fascism is a matter of taste." The Pact had only defined spheres of influence with no mention of changes in the status of sovereignty of the nations affected. It began to deteriorate with the Soviet invasions of Finland and then the Baltic States, prompted in part by Stalin's fears of a powerful Germany turning East after its successes in the West. Stalin's invasions were, however (as the intent to accomplish these was not communicated to the Nazis beforehand), a severe irritant to Berlin and prompted concern that Stalin was seeking to form an anti-Nazi bloc. Molotov's reassurances to the Nazis, and the Nazis mistrust, intensified. On June 16, 1940, as the Soviets invaded Lithuania, but before they had invaded Latvia and Lithuania, Ribbentrop instructed his staff "to submit a report as soon as possible as to whether in the Baltic States a tendency to seek support from the Reich can be observed or whether an attempt was made to form a bloc." Stalin's strike in Finland and the Baltics was one factor in prompting Hitler to turn East when he did. Only two weeks after the Soviet invasion of the Baltics, Berlin requested Finland to permit the transit of Nazi troops. Five weeks after, Hitler had already issued a secret directive "to take up the Russian problem, to think about war preparations," a war whose objective would include establishment of a Baltic confederation. According to historian E. H. Carr, Stalin was convinced that no German leader would be so foolish as to engage in hostilities on two fronts. He therefore considered it to be a foregone conclusion that, if Germany was at war with the West, it would have to be friendly with, or at least neutral towards, the Soviet Union. If so, then Stalin's invasion of Finland and the Baltics was a misstep: the Pact was only useful to Germany as long as it was simply a definition of spheres of influence and kept Soviet forces away from the borders of the Reich. That the Russian armies should stand on this line was clearly necessary for the safety of Russia against the Nazi menace. At any rate, the line is there, and an Eastern Front has been created which Nazi Germany does not dare assail. They mutually express their conviction that it would serve the true interest of all peoples to put an end to the state of war existing at present between Germany on the one side and England and France on the other. Both Governments will therefore direct their common efforts, jointly with other friendly powers if occasion arises, toward attaining this goal as soon as possible. The pact also affected Comintern policies: despite an unwillingness by some Western Communists to accept Nazi Germany as a 'friend' (on December 3, CPGB declared the war against Germany 'just'), Moscow soon forced the Communist Parties of France and Great Britain to adopt an anti-war position. On September 7, Stalin called Georgi Dimitrov, and the latter sketched a new Comintern line on the war. The new line—which stated that the war was unjust and imperialist—was approved by the secretariat of the Communist International on September 9. Thus, the various Western Communist parties now had to oppose the war, and to vote against war credits. A number of French communists (including Maurice Thorez, who fled to Moscow), deserted from the French Army, owing to a 'revolutionary defeatist' attitude taken by Western Communist leaders. This anti-war line was in effect for the duration of the Molotov-Ribbentrop Pact, i.e., until the German attack on the USSR on June 22, 1941—this despite the fact that Nazi Germany proceeded to start rounding up Communists in the various European nations that it invaded and conquered in the interim. On September 28, 1939, the three Baltic States were given no choice but to sign a so-called Pact of defense and mutual assistance, which permitted the Soviet Union to station troops in Estonia, Latvia, and Lithuania. On the same day, a supplementary German-Soviet protocol (German-Soviet Boundary and Friendship Treaty,) had transferred Lithuania's territory (with the exception of the left bank of river Scheschupe, which remained in the German sphere) from the envisioned German sphere to the Soviet sphere of influence. Finland resisted similar claims, and war broke out with the Soviet Union on November 30, 1939. After more than three months of heavy fighting and losses in the ensuing Winter War—initially an embarrassment to the much larger Soviet army—the Soviet Union overwhelmed Finland's military. The ensuing peace negotiations resulted in approximately 10 per cent of Finland's territory ceded to the Soviet Union (a more onerous territorial change than the USSR had sought to impose on Finland before the outbreak of the war, although the "Terijoki Governement" episode shows that Stalin's original goal was to occupy the entire country) and a lease on the Baltic port of Hanko. The about 400,000 Finnish inhabitants of the occupied territories were evacuated and resettled in Western parts of Finland. On June 15–17, 1940, after the Wehrmacht's swift occupation of Norway, Denmark, the Netherlands, Belgium, Luxembourg, and the defeat of France, the three Baltic states were occupied, and they were soon annexed by the Soviet Union. The USSR annexed the whole of Lithuania, including the Scheschupe area, which was to be given to Germany. On January 10, 1941, the German ambassador to Moscow von Schulenburg and Commissar for Foreign Affairs Viacheslav M. Molotov signed another secret protocol: the Lithuanian territories west of the river Scheschupe were to be regarded as in the Soviet sphere, and Germany was paid 7.5 million dollars (31.5 million Reichsmark) compensation by the USSR. Finally, on June 26, four days after France sued for an armistice with the Third Reich, the Soviet Union issued an ultimatum demanding Bessarabia, Bukovina, and the Hertza region from Romania. Alerted to this Soviet move, Ribbentrop stressed in his reply to the Soviet leaders on June 25, 1940, the strong German "economic interests" (the oil industry and agriculture being paramount) in Romania. This ensured that Romanian territory would not be transformed into a battlefield. Additionally, Ribbentrop claimed that this German interest also arose from a concern over the "faith" and "future" of 100,000 ethnic Germans of Bessarabia. In September, almost all ethnic Germans in Bessarabia were resettled in Germany as part of the Nazi-Soviet population transfers. In August 1940, fear of the Soviet Union, in conjunction with German support for the territorial demands of Romania's neighbors and the Romanian government's own miscalculations, resulted in more territorial losses for Romania. The Second Vienna Award (orchestrated mainly by Ribbentrop) created a competition between Romania and Hungary for Germany's favor concerning Transylvania. By September 1940, Romania's economic and military resources were fully dedicated to German interests in the East. Adolf Hitler in a public speech in Danzig in the end of September, 1939. The Soviet-occupied territories were organized into republics of the Soviet Union. The local population was purged of anti-Soviet or potentially anti-Soviet elements and in new border regions tens of thousands of people were executed and hundreds of thousands were deported to far eastern regions of the USSR and to Gulag work camps, where many perished. Later, these occupied territories were in the front line of the war, and also suffered from the Nazi terror on the WWII Eastern Front. By early 1941, the German and Soviet occupation zones shared a border running through what is now Lithuania and Poland. Nazi–Soviet relations began to cool again, and signs of a clash between the Wehrmacht and the Red Army began to show in German propaganda — a clash that was not without appeal to some in occupied Western Europe, where anti-Bolshevism stemming from the time of the Russian Civil War twenty years before had not faded. The Nazis had started recruiting for their cynical 'great crusade' against the Soviet Union. By appearing as the unifying leader of the West against the East, Hitler hoped to boost Nazi popularity at home and abroad, and used this as an instrument for peace feelers with the United Kingdom. Meanwhile, the Soviet Union was supporting Germany in its war effort against Western Europe through the German-Soviet Commercial Agreement, with supplies of raw materials (including phosphates, chromium, iron ore, mineral oil, grain, cotton, and rubber). These and other supplies were being transported through Soviet and occupied Polish territories, and this allowed Nazi Germany to circumvent the British naval blockade. Nazi Germany terminated the Molotov-Ribbentrop Pact with its invasion of the Soviet Union in Operation Barbarossa on June 22, 1941. Hitler issued a proclamation at 5:30 am dissolving the non-aggression Pact. At the same time a note indicating a state of war now existed between Nazi Germany and the Soviet Union was delivered to Molotov. However, the Pact had already been annulled nearly two hours earlier with the commencement of military operations at 3:15 am. 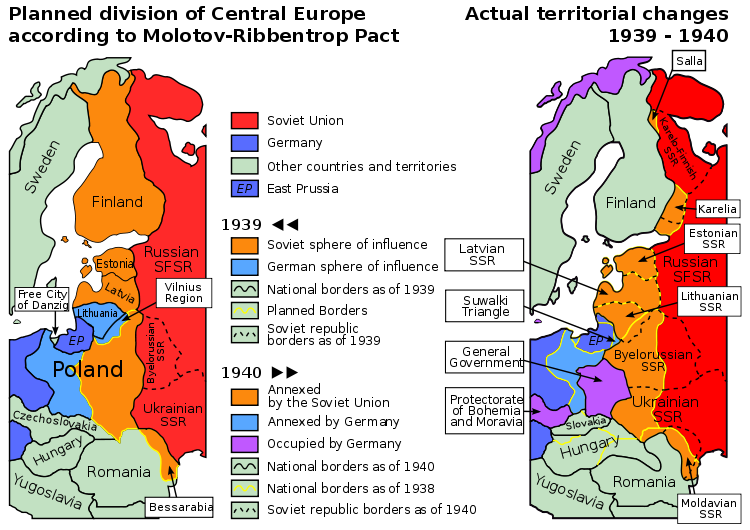 After the launch of the invasion, the territories gained by the Soviet Union due to the Molotov-Ribbentrop Pact were lost in a matter of weeks, and the Baltic countries were incorporated into Reichskommissariat Ostland by the Germans, while the native population were conscripted for either labor or military service by the occupation authorities. For decades, it was the official policy of the Soviet Union to deny the existence of the secret protocol. On August 23, 1986, tens of thousands of demonstrators in 21 Western cities including New York, London, Stockholm, Toronto, Seattle, and Perth participated in Black Ribbon Day Rallies to draw attention to the secret protocols. It was only after the Baltic Way demonstrations of August 23, 1989, set on the 50th anniversary of the pact, that a special commission under Alexander Nikolaevich Yakovlev started an investigation into the existence of the secret protocols. In December 1989, Yakovlev concluded that the protocol had existed and revealed his findings to the Soviet Congress of People's Deputies. As a result, the first democratically elected Congress passed a declaration admitting the existence of the secret protocols, and condemning and denouncing them. All links Retrieved July 21, 2008. ↑ 4.0 4.1 Tentative Efforts To Improve German-Soviet Relations, April 17 - August 14, 1939. The Avalon Project at Yale Law School. ↑ David M. Glantz Stumbling Colossus: The Red Army on the Eve of World War. (Lawrence, KS: University Press of Kansas, 1998), 3-7 specifically, and the rest of the text generally. ↑ Excerpt of speech to the Eighteenth Congress of the Communist Party of the Soviet Union on 10 March 1939, regarding the "Munich Agreement." .Retrieved August 30, 2008. ↑ Paul Flewers, reprinted from New Interventions 6 (2) (1995) From the Red Flag to the Union Jack: The Rise of Domestic Patriotism in the Communist Party of Great Britain.whatnextjournal.uk. Retrieved August 30, 2008. ↑ Taylor and Shaw, Penguin Dictionary of the Third Reich. (1997), 246. ↑ Jerzy W. Borejsza, Klaus Ziemer, Magdalena Hułas, (eds.). Totalitarian and Authoritarian Regimes in Europe: Legacies And Lessons from the Twentieth Century. (London: Berghahn Books, 2006. ISBN 1571816410), 521. ↑ E. H. Carr. German-Soviet Relations between the Two World Wars, 1919-1939. (Oxford: 1952), 136. ↑ Steven J. Zaloga. Poland 1939: The Birth Of Blitzkrieg (Campaign). (Botley, UK: Osprey Publishing, 2002), 80. ↑ Declaration of the Government of the German Reich and the Government of the U.S.S.R. of September 28, 1939.The Avalon Project at Yale Law School. Retrieved August 30, 2008. ↑ Flewers, from New Interventions 6 (2) (1995) From the Red Flag to the Union Jack. Retrieved August 30, 2008. ↑ German-Soviet Boundary and Friendship TreatyThe Avalon Project at Yale Law School. Retrieved August 30, 2008. ↑ Seven Years War?, TIME Magazine, October 2, 1939, Retrieved August 30, 2008. ↑ Conclusions of the Estonian International Commission for the Investigation of Crimes Against Humanity.historycommission. Retrieved August 30, 2008. - Phase II: The German occupation of Estonia in 1941–1944. Retrieved August 30, 2008. ↑ Borejsza, Ziemer, and Hułas, 2006, 521. Sheen, John Fulton. Communism and the Conscience of the West. Bobbs-Merrill Co, 1948. Sontag, R.J. and J.S. Beddie, (eds.) Nazi-Soviet Relations 1939-1941. Washington, DC: U. S. State Department, 1948. Taylor, A.J.P. The Origins of the Second World War. Simon & Schuster, 1996. This page was last modified on 13 October 2018, at 16:24.